At the time I'm sitting down to write this post, there is still no baby update. And at the rate things are going, I'm beginning to wonder if she's ever going to come. By the way she's kicking and squirming, I would think she couldn't get out of that cramped space soon enough, but it appears instead that she's deciding to soak up these last few days of peace and quiet before being drowned in kisses and slobber (yes, the dogs are eagerly awaiting her arrival as well)! After nine months of planning (ok, let's get real...I've been planning this nursery for waaaay longer than that) it is finally complete and I'm excited to share the details with you. As soon as we knew we were having a girl, I knew I was going to make it feminine to the extreme. There would be none of this gender-neutral decor, no grays and yellows - just girly-girl prettiness. Here is a look at how the room started. When starting to gather design inspiration for the room I learned pretty quickly that 'baby decor' wasn't really my thing. I just couldn't get into the themed nurseries and found myself turned off by much of the nursery decor out there. Instead, I found myself gravitating towards just an overall soft, feminine feel. Let's just cut to the chase and get to the end result already! 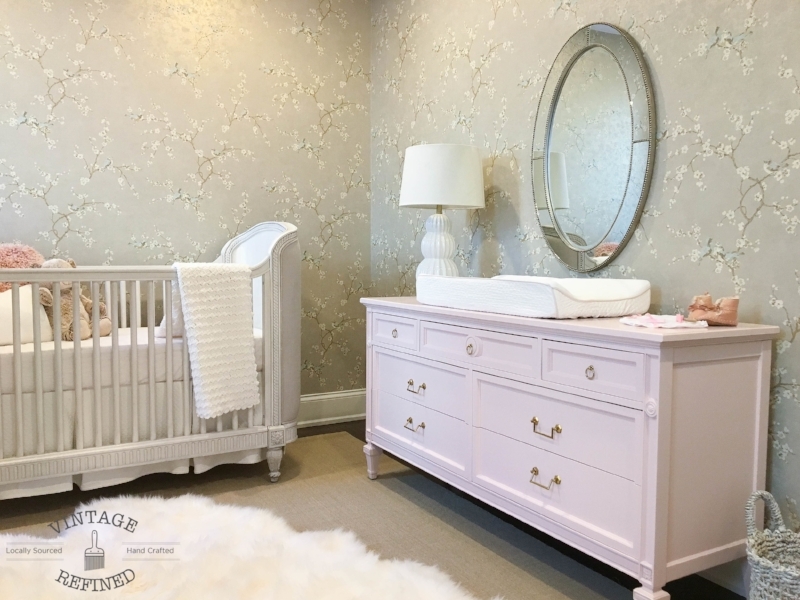 Even before knowing what direction I wanted to take the nursery, I knew it would include a pink dresser. I figured I could incorporate it into the overall style, regardless of what that ended up being. After all, pink is the new neutral, right?! 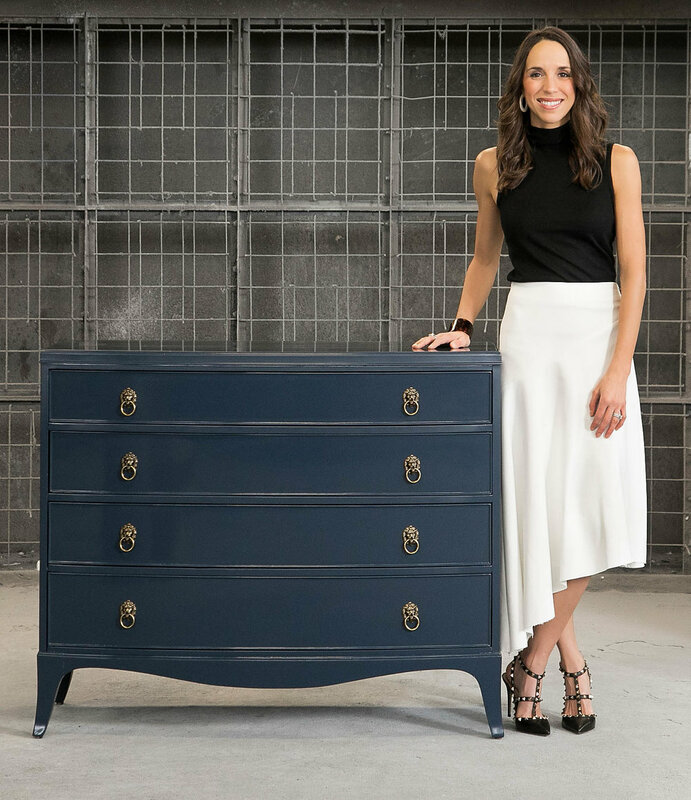 You can get all the details about the dresser here. The dresser doubles as a changing table, which is a pretty popular trend these days. I don't know the exact percentage, but a good deal of my clients are future moms looking for a dresser/changing table. For now, I decided to skip the wood topper, but may have one built down the road if necessary. Besides the pink dresser, there were a couple other items that were no-brainers for me. The first one being an upholstered crib. I have swooned over the cribs from RH Baby & Child since I first laid by eyes on them, and despite the fact that you can purchase a crib for a fraction of what one of these suckers cost, this was one item I wasn't willing to compromise on. Another must-have was wallpaper. My original thought was a large-scale chinoiserie design, but I quickly learned that also meant a large-scale price tag. At the end of the day, it wasn't going to fly. I ended up finding this cherry blossom print from York Wallcoverings that I think in the long run, is probably a better decision all around. It's a more muted design, but still packs a punch and gives the space a more sophisticated feel. Yes, I have been told by numerous people that I am absolutely crazy for some of these design choices. It is a sure bet that the crib railing will be used as a teething toy, and as she grows older, she'll express her creativity with a permanent marker all over the wallpaper. However, as much as people may have forewarned me, I'd like to think she will take after me and have an appreciation for all things beautiful. Then again, if she takes after me, that means she's also going to go through a phase where she dyes her hair black and sports multiple body piercings. Yeah, I'm just going to block out those thoughts for now! So anyways, that leaves us with a pink dresser, an upholstered crib and wallpaper. The one missing essential is a glider. I sometimes have a habit of choosing form over function, but this was one piece of furniture where comfort comes first - even if it wasn't my choice. I probably sat in at least 25 different gliders before attempting to order a 'more stylish' one I saw online that I didn't ever see in person. When calling up the saleslady to place my order she questioned whether or not I had sat in the glider since they didn't physically carry it at their store. I explained that I hadn't, but I'm sure it'll work just fine, to which she responded, "I'm sorry ma'am, but if you haven't sat in the chair, then I can't sell it to you." I was left speechless! I had to give her credit that she cared more about my well being and satisfaction than about closing a sale. I then hunted around town to find a store that carried the 'stylish' glider so I could physically sit in it. I had to admit, she was right. It wasn't as comfortable, and at the end of the day I opted for the chair that was most comfy. Once we had the essentials, everything else came together pretty easily. Actually, I take that back. A more accurate statement would be everything came together pretty easily in my head. In reality, it was all downhill from here. First I purchased a vintage chandelier from an antique store only to get home and realize it had a socket plug at the end instead of wiring for a ceiling fixture. All sales were final, which meant Kyle got to spend an afternoon watching YouTube videos and perfecting his electrical skills. As it turns out, it is possible to convert a socket plug to a ceiling fixture, although it may require a few curse words being yelled in the process. Next, the window treatments were installed only to find out the wrong sized rods had been ordered. This was realized after the holes were drilled into the wallpaper. I think I really would have benefited had I taken a lamaze class prior to this incident. Deep breaths. Deep breaths. I'm now just waiting for a diaper blowout all over that white shag rug. I know it's happening, it's just a matter of time! But overall, I am thrilled with the final outcome. It's warm and inviting and because the main design elements don't scream 'nursery' it can grow with her...even if that means the walls are one day covered with boy band posters and the floor is littered with dirty clothes.